DESIGNED and PRINTED in ISRAEL! This feminine Bat Mitzvah invitation is raised printed on Kunzite shimmer card stock layered over Diamond Pink, Amethyst Shimmer, and Ruby Shimmer card stocks for an amazing first impression! This feminine Bat Mitzvah invitation is raised printed on Kunzite shimmer card stock layered over Diamond Pink, Amethyst Shimmer, and Ruby Shimmer card stocks for an amazing first impression! A 1-1/2″ wide pale lavender ribbon with twin pearl-mounted fabric flowers provide the finishing touch in the lower right corner. Measures 7-3/4″ square. Shown with Plum (name) and Lilac (text) inks and lettering styles Zapfino (text) and optional Hebrew style Spacer. The Reception and Response enclosures will print on matching layered stock, and the Informal notes will print on layered folding stock. 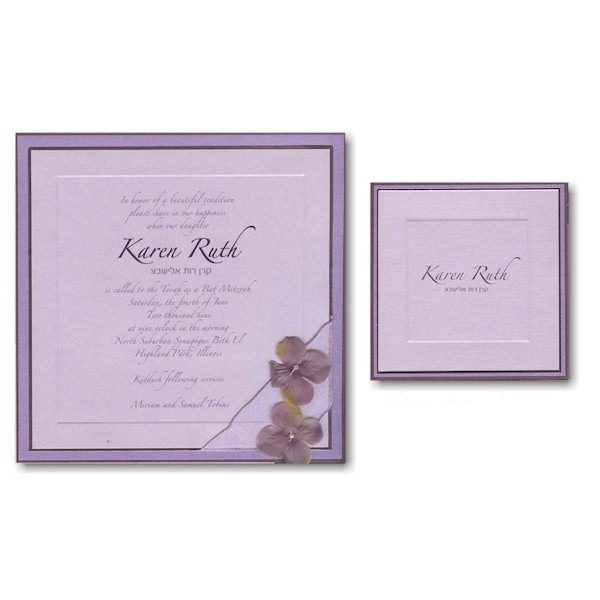 This Bat Mitzvah invitation is accompanied by single V-flap Kunzite shimmer envelopes. 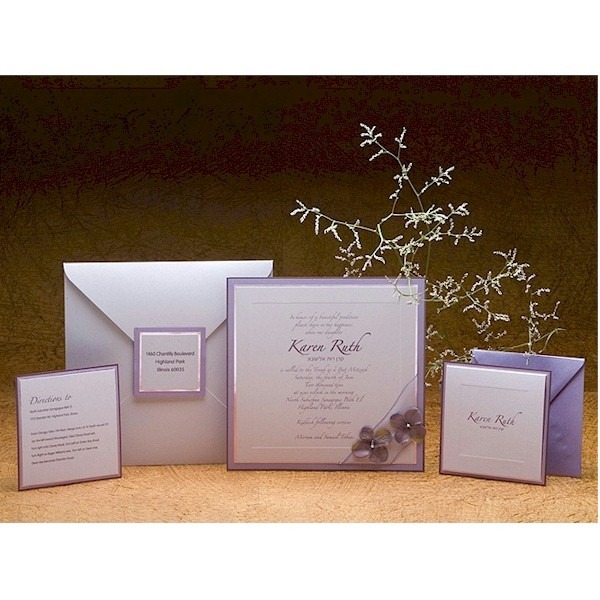 Pricing includes a triple-layered seal with your return address for the flap of the envelopes. Please note: Due to the square presentation of this invitation, additional postage is required. Consult your local post office for details prior to mailing. Please note: The designation “Made in Israel” may be printed on the backside of this invitation at no additional cost.